A furoshiki has two advantages over a bag…firstly, it can be untied and thrown into the washing machine, and secondly, it can be folded to specifically suit the item in question. I’ve been making them out of my stunning fabric finds from Cash Palace Emporium. If you’re a sewer, this is the perfect excuse to use up some of those beautiful pieces of fabric you’ve been hoarding. Originally, furoshiki sizing was based on kimono silk, which was traditionally 14″ (35.5cm) wide. The fabrics were sewn into pieces two or three widths across. If you’re making them at home, I recommend 70cm and 100cm squares – the 70cm ones are a good size for wine bottles and iPads and books, whereas the larger ones are great for groceries and shoulder bags. 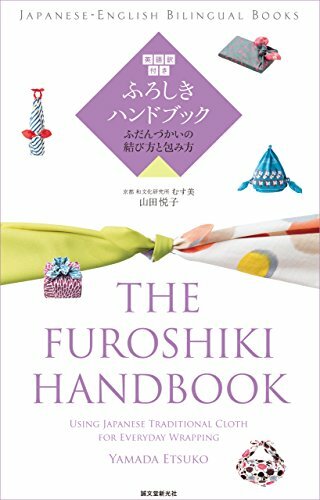 Here are my tutorials for using your furoshiki. Enjoy! Oh you can always create a whirlwind Celia with your enthusiasm and your ingenuity. . Can you imagine how much trouble they went to in Japan to save the environment by showing people this amazing chart and then Trump comes along…………. We can only do what we can do…sadly, some things are out of our control or influence. God, that video is fantastic – what a guy! You are so clever. These fabrics are beautiful. Wish I weren’t a sewing klutz and a knot tying klutz as well. At least I can admire the creativity of others. The Samurai is amazing! Very versatile “bags”. This is worth trying – we need more things that work and just look nice! What a marvellous idea, thank you. Shame I recently culled my scarf collection, they could have been recycled. No matter I have plenty of material in the sewing box. I keep one (rather ugly) fold up shopping bag in my hand bag, I can replace it now with something pretty. Best wishes. What a happy post! Love all your photos, especially the one of you with ‘bed hair’ :) !! Began using cloth this way in my twenties when I first went to Japan . . . for fun first and now to teach others we do not always need PVC . . . I often use tea towels to wrap gifts, though not with such flair. Loved that video clip and your enthusiasm for new tricks. You know I can’t resist something so clever! :) You have the most gorgeous tea towels in your collection, Fra. Think this might work with repurposed torn sarongs too! That was great and ‘somewhere’ I have that instruction sheet………MUST dig it out. Yes, will send it on………..thank you for being an agent of change!! Susan, I’ve put a link to the pdf in the post. How cool is it that the Japanese government did this as an initiative to reduce waste? Kim, that’s a BRILLIANT idea! I’m going to do the same! Thank you! Oh so now you’ve given me the great idea to use the many ones I have here that I use as table mats and runners for crochet projects instead of the plastic bags I normally use. Excellent! This is so creative, and pretty too. Am going to try this ! What a creative way to use fabric! I love the byo wine! That’s fascinating Celia and what an enterprising young man! I love the way you have used them and I must give them a go – but never having been a good boy scout (i.e. no good at knots) I might give myself more laughter than practical help! That’s no bad thing – I’ll forward this to a more dexterous and fabric minded friend with a swag of material I know she will put to good use. Always the best way to wrap gifts instead of wrapping paper that just gets discarded. Honestly…you’re a complete bloody genius! Very clever, I am going to keep this in mind for Christmas. I always hate all that discarded wrapping paper. Celia this is awesome! Seattle banned plastic bags several years ago so I have a small cloth bag that folds into a small pouch and it fits easily in my purse. Now I want to make my own – I saved the instruction page – looking forward to getting inspired. And, a samurai too?! Bonus round! Hi Celia, I am a little late to the LIKE button but I have been locked out of WordPress since leaving Perth on 14th January. I have been able to read all I follow but could do nothing else. So, how to avoid it before it happens and what to do if it does. Download the “one use only” recovery codes in your settings page, keep them safe. If you neglected to do this and have lost your account access, you will need to request 2 (two) codes from WordPress by email. This sounds simple but it is almost impossible to find a contact email for them. Fear not! help@wordpress.com. Hope this helps someone because it almost drove me crazy trying to find a solution. As always, your post is absolutely awesome, thank you. Pure Glorious Genius … the BEST and Most Entertainingly Informative blog on the Net , by the MOST GIVING , Caring , Wonderful Angel ever …. This made me smile because I wrap my christmas presents in T Towels!